Not everyone likes Anita Sarkeesian, and it’s because she likes to point out fundamental flaws in some of our most beloved experiences. No one likes being told that they’re wrong about something, but Sarkeesian does that on a daily basis. Her Feminist Frequency organization started off as a modest Kickstarter but quickly grabbed netted a lot more money than initially expected. So where has that all been spent? It’s something that critics of Anita Sarkeesian like to bring up, and something that hasn’t really been properly discussed by the activist herself until now. In an update to her Kickstarter page, Skarkeesian has outlined exactly how funds have been distributed over the two years that Feminist Frequency has been around, and how the overwhelming support has fundamentally changed the ideas she had for the project back at inception. Initially, the entire Tropes vs. Women series was only meant to be five videos long, with each clocking in at 10-12 minutes. That set the low Kickstarter goal, but immediately changed after the $6000 was reached in less than 24 hours. The need for more meticulously combed and thought out content also became a necessity after the hate started appearing, as Sarkeesian explains. One thing was immediately apparent, however: the harassers had made it their mission to pick apart and distort every minuscule detail of my work and even my personal life in order to try to discredit, defame, and ultimately silence me. My arguments and examples had to be airtight; I felt I could not afford to make a single mistake or error. That was, and is, a lot of pressure. 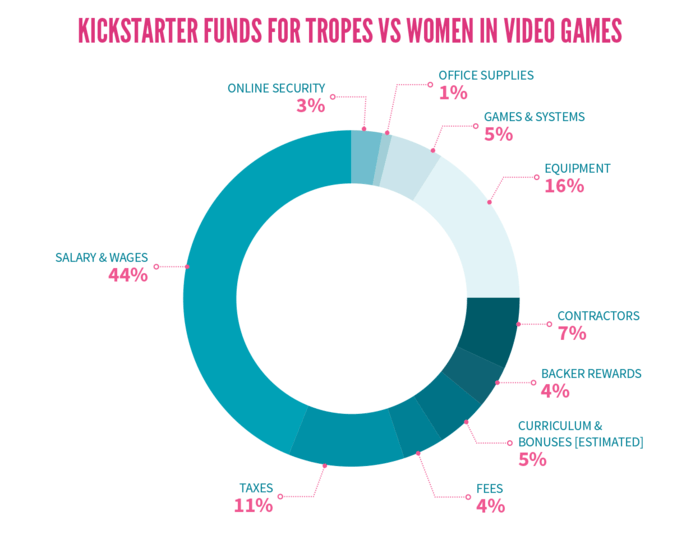 Feminist Frequency was no longer a small side project; something the end Kickstart total of $158,922 made very clear. The scope of the project was increased, meaning more games were played, more people were hired and production costs increased. Feminist Frequency also became a fully registered, fully staffed non-profit organization, with Sarkeesian taking it up as a full-time duty. That’s why the financial breakdown for the past two years doesn’t just read “video production” and “games”. What has that all accomplished? Over the past two years Sarkeesian and her team have released six long, in-depth Tropes vs. Women videos, with work on the next currently underway. Sarkeesian is pleased at how their work already has a marked impact on the gaming industry, with games media now questioning tropes that they never used to. She’s pleased that there’s a stronger awareness of inquiries in gaming culture, and that developers themselves are beginning to realise that. She’s already been invited to studios like EA DICE, Bungie, and ArenaNet to give talks, as game developers around the world recognise the importance of what she is saying. Developers who were responsible for some of the games that I have critiqued in my series have graciously accepted the criticism and have promised to do better in the future. She also doesn’t brush off the emotional toll all of her work has taken on her personal life, and acknowledges how much worse harassment became ofter the formation of GamerGate. Her, along with other partnered organisations, fight online harassment outside of the public eye, which forms just another pillar of what Feminist Frequency is all about. But there is also work being done behind the scenes in private meetings and consultations with major social media and gaming platforms, and by partnering with other organizations to form a task force with the goal of ending online harassment. 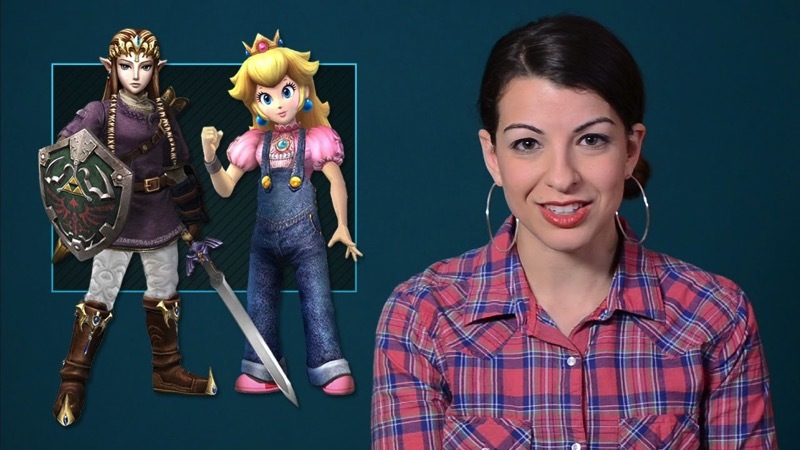 It’s very easy to nitpick a lot of what Anita Sarkeesian fights for, but at the end of the day I consider her work to be an important part of our industry today – even if I don’t always quite agree with it. Sarkeesian and Feminist Frequency have brought to light inequalities that shouldn’t really exist anymore, and awareness alone has already changed so many paradigms in the way games are made. That alone is commendable, and I’m eager to see where she and her team go next.